Accept or decline true fit guarantee. THIS ITEM WILL SHIP IN 3 BUS. DAYS. WE CANNOT SHIP THIS ITEM OUTSIDE OF THE UNITED STATES. These Right Handed Classic White bowling shoes are made with US top grain leather and they have a buckskin slide sole on the left foot and a smooth rubber traction sole with a leather tip on the right foot. This design is made to help the bowlers feet feel cool and comfy. 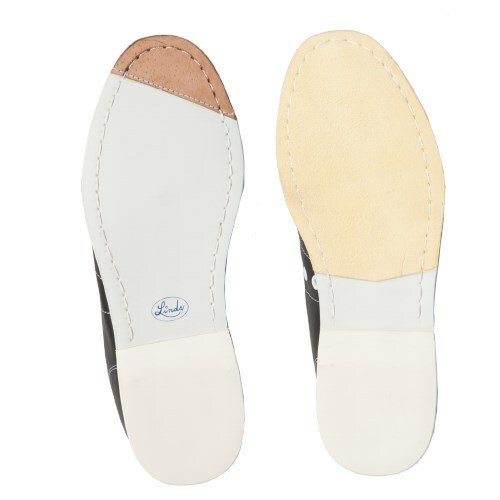 Don't miss out on these quality made shoes that also have removable antibacterial footbeds. The product has been around for a long time and wears well. They run large - a size larger than regular shoes. Be sure to purchase the Tru fit. Exchanges are easy. Well worth the money. Bowl in 3 leagues and feel very comfortable and secure in Linds. Had the same pair over 30 years ago and loved them so bought a new pair. Great shoe. I have worn these shoes for years and even had the toe restructured since I apparently drag my toe and wear them out. I finally bought a new pair. I prefer these over any other bowling shoes. I have bought different brands, but never could wear them as they would not slide,etc. Linds are the best. The service was great, received shoes with in a few days. Will use bowling.com again in the future. I have been bowling for 43 years and have averaged in the mid 220's for the last 10. In the past when I have purchased Linds I could use them right out of the box. With this new purchase I tried them on in practice and couldn't seem to slide on the heal. This was very disappointing as I don't practice and can't break them in during my league so they have been in the back of my car for about 4 weeks now. Anyone have a clue how to break these in better? They do slide but the heal sticks. Otherwise these are the only type of shoe I would own. The shoes fit in length and toe, but too big in heel area. Because of restrictions for returning, I just past the shoes on to another player in league who wore same size and hope they work for that player. It would take the rest of my lifetime and perhpas the next to break these shoes in!! I wasn't looking for them to last forever!!! Would definetly not recommend them. Do they have interchangeable soles? Thanks for the question! 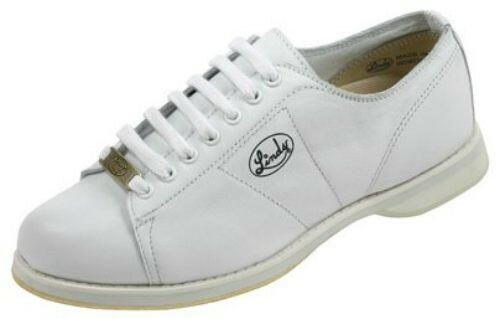 The Linds Womens Classic White Right Hand do not have interchangeable soles. do you have them for left handed? This shoe does not have interchangeable soles or heels unfortunately. It also does not have interchangeable toe caps like some of the 3G models have. Hi Patti! Unfortunately, these shoes do not come in a narrow width. The regular width for women shoes is a B width. Linds has US top grain leather but it is not made in America. Are whie classic linds for left handers still available? Hello. Unfortunately, the left handed version is not available anymore. Are the bottoms stitched on? Could I see the bottom of the shoe? Hi Kim. Yes these soles will be stitched on. 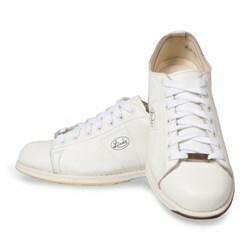 These will not be interchangeable but these are for right handed bowlers. Please explain the tru fit guarantee. Hello Jim! The True Fit Guarantee is a one time fee of $5.99, we will send a pre-paid shipping label with your shoes. If your shoes do not fit and you need to exchange them for a smaller or larger size, you can use the shipping label to ship them back to us. The True Fit Guarantee will also cover our $5 reship fee that we normally have for shoe exchanges as well. Are they true to size ? According to customer reviews, this shoe will be true to size. If you are not 100% sure on the size to purchase, you can add the True Fit Guarantee with the shoes. is their free shipping on this item? Hello Joyce! We do offer free ground shipping on our items. Ground shipping generally takes 3-7 business days to get to you. Unfortunately this is only offered in regular width or wide width. We do not have any shoe models available in narrow. do they come in any other color,years ago I had purple and grey would love to have again,not the black,white or the other strange colors. had a pair year ago the color was purple and gray,LOVED THEM..is it possible to get the same color?? Yes, these are the medium width shoes. If during the first year of normal use, your new shoes are damaged due to a manufacturing defect in workmanship or materials, bowling.com will replace your shoes free of charge! With the Platinum Protection Plan, there is no need to wait for a lengthy manufacturer warranty claim. We will replace your shoes immediately. Unfortunately, these will come in a standard B width for women. Do the shoes run truth to size? Do these shoes have a good heel? Yes, these will have an excellent heel! The True Fit Guarantee is a one time fee of $3.99, we will send a pre-paid shipping label with your shoes. If your shoes do not fit and you need to exchange them for a smaller or larger size, you can use the shipping label to ship them back to us. The True Fit Guarantee will also cover our $5 reship fee that we normally have for shoe exchanges as well. Unfortunately, it does not cover a full refund. There will be a 15% restocking fee on all returns. Due to the time it takes to produce the Linds Womens Classic White Right Hand ball it will ship in 3 bus. days. We cannot ship this ball outside the United States.